Is it at all possible that the Monarch of this universe, the All-Glorious One, should create the universe with quite elevated aims in order to show His perfection, on the other hand, should not give rewards to those who, in return, are faithful and worshipping; and should not punish those who insult and deny them? The reward and the punishment is hardly felt in this world. So there is, and should be, a place of reward and punishment somewhere else. About 300 billion galaxies that are known and about 300 billion stars therein continue their existence in a perfect fashion. All galaxies, stars, planets, and satellites revolve around boththemselves and certain orbits along with the systems they belong to. Furthermore, the concept of speed in the universe is at mind-boggling dimensions compared to the worldly measures. of stars, planets, galaxies, galaxy clusters that weigh millions of tons move in the space at a terrifying speed. The world rotates around its axis at of 1670 km/hr and around the sun at a speed of 108.000 km/hr. While the solar system rotates around the center of the galaxy at a speed of 720.000 km/hr, the Milky Way moves in the space at a speed of 950.000 km/hr. These movements are so intense that each year the world and the solar system go 500 million kilometer further than the previous year’s position. Is it at all possible that such an orderly movement be coincidental? How can a man who has to explain the movement of a car on a smooth surface with the skill of the driver attribute the orderliness in this universe to chance? Yes, the universe is such a palace that stars are the candles of that palace. The world is just a very small room in that palace. The sun is the lamp and the stove, and the moon is the night lamp of that room. The sun, the lamp of our world, is 1.300.000 times greater than our world. In our own galaxy, the Milky Way, there are 200 billion to 300 billion stars. Can you imagine a place in which there are 300 billion stars, each of which is as big as the sun? Who can make all those stars travel without colliding with each other? The central heat of the sun is 20.000.000 degrees centigrade. (It is a known fact that water boils at 100 degrees centigrade.) If we were able to bring a substance as tiny as the head of a needle to the world from the sun, it could burn something which is 160 km far away. If the whole world were woods and coal, it would not meet the sun’s need of fuel even for one day. Who burns the stove of the sun without a pause? The distance of the sun to the world is 150.000.000 km. The diameter of our Milky Way is 100.000 light years. (The speed of light per second is 300.000 km.) If we were to get on a rocket going at a speed of 10.000 km in a second, we would need 15.800.000.000 years to go from one end of our galaxy to the other end. We have learnt that the sun is 1.300.000 times greater than the world. Now please be careful! We are going to talk about a star which our imagination cannot grasp: The star of Canis Majoris! This star, whose radius is 2100 times as big as the radius of the sun, is known as the biggest star. This star is so big that more than seven quadrillion worlds are necessary to fill inside it. Let us take a look at our world this time: There are 1.000.000 different species in the world. If we suppose each species is a regiment, there are 1.000.000 regiments in the army of the world, and each regiment has numerous members. In the regiment of flies, there are more flies created in one spring than human beings to be created till the end of the world. Now we ask you: We know that a village must have a headman, a city must have a governor, and a country must have a president; is it at all possible that this magnificent sovereignty seen in this universe be without a governor? When we see a marvelous palace, we understand that the palace must have an owner. Even if we do not see its owner, the palace, with its existence and beauty, points to its owner and his glory. If such a simple palace cannot be without an owner, is it at all possible that this palace which we call the universe can be without an owner? If we see a great army moving in an orderly fashion, but if we do not see its commander, is it ever likely that this army is without a commander and an owner? Definitely not! Some situations such as soldiers’ proper manners, having weapons, having their clothes changed, having their needs met point out that this army belongs to a commander and a governor and that it acts in accordance with his orders. If even such a small army cannot be disciplined, fed and if their needs cannot be met without a commander and cannot be referred to chance, is it ever possible that thousands of different armies of animals and plants be without a commander and owner? As we have said, it is such an army that there are different nations, different weapons, different clothes, different orders, different appearances, different food etc in it. Is it at all possible that such an army be without a commander? This army has such a Commander that He forgets none of them and does not confuse anything while doing something. This army is much greater than our imaginary army and it makes us know its Commander, God with His names the Absolute Ruler and Monarch, as greatly and perfectly. Denying Almighty God, who is the Sustainer of this army, is only possible through denying this apparent sovereignty. The one who cannot deny this apparent sovereignty cannot deny the Almighty God, the Monarch of Pre-Eternity and Post-Eternity, either. That is to say, the existence of Almighty God is as clear and precise as the existence of this universe. In the 1st step, we saw the sovereignty in the universe and through the rule “Acts cannot be without one who performs them”, we reached the existence and the name of God, the Monarch, Who is the possessor of the sovereignty. In this step, we are going to prove that the name of Monarch (Sultan) necessitates the Hereafter. As is known, even the minor sultans give rewards to those who serve them well and punish those who rise in a rebellion against them. Reward and punishment are crucial for sovereignty. If a rebel revolts against the sultan and says: “The Sultan cannot get hold of me, he cannot punish me, he does not have power, etc.” The sultan should have him caught and put him in prison in order to protect the glory of his sovereignty. Even if there is no prison in his country, in order to preserve the glory of his sovereignty, he should make a prison for that rebel and catch him and put him in the prison so that the glory his sovereignty may be protected and humiliation will not replace dignity. Does God, the Monarch of Pre-Eternity and Post-Eternity, whose existence we proved in the 1st step, truly award those who serve Him in this world? And in this world, does He truly punish those who revolt against Him? No He does not! Neither those who serve are awarded nor those who revolt are rightfully punished in this world. Then we ask again: What should God Almighty, the Monarch of Pre-Eternity and Post-Eternity, do to protect the dignity and glory of His sovereignty? Surely, He is supposed to prepare places for both reward and punishment, and award those serving Him and punish those revolting against Him. Otherwise, He is regarded not to have protected the glory of His sovereignty. Yes, all those words are the ones resulting from disbelief which a disbeliever indirectly comes to say. Even if God did not have any reasons to create Hell, he would create it just because of those words of the disbeliever and put him in there and thus, protect the glory of His sovereignty. 1. From particles to stars and from atoms to galaxies, there is a magnificent sovereignty visible in this universe and this sovereignty is ruling over everywhere. 2. A village must have headman, a city must have a governor, and this country must have a president; similarly, this sovereignty going on in this universe cannot be carried out without the Sultan. To deny this Sultan is only possible by denying the whole universe; and to deny the visible sovereignty is not possible for anybody who is not out of his mind. 3. The Sultans award those who serve them. It is to protect the dignity of the sovereignty. However, those who serve the Sultan of this universe are not deservedly awarded in this world. Then, there should be somewhere else to give the reward so that the dignity of the sovereignty should be protected. 4. The sultans punish those who revolt against them; thus, they protect the magnificence and glory of their sovereignty. Yet, on the other hand, those who revolt against God Almighty, the Sultan of this universe, are not deservedly punished. So, there should be somewhere else for punishment so that the dignity of the sovereignty should be protected. 5. In order to deny the Hereafter, one should firstly deny the name of Sultan of God Almighty. In order to deny the name of Sultan, one should deny the glorious sovereignty apparent in the universe. So, if one cannot deny the glorious sovereignty, he cannot deny the One Who is the Sultan of this sovereignty, either. And the one who cannot deny the Sultan cannot deny the Hereafter, either, since the glory of the sovereignty is only protected by the arrival of the Hereafter. As we said in the beginning, the existence of the Hereafter is proven through three steps. Each step is like a chain. These chains are interlaced, and one cannot do any harm to any single chain without completely destroying the whole. If one cannot break all of the chains, he cannot break a single chain of it, either. 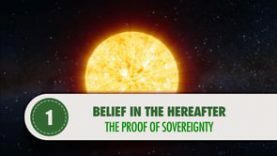 So, the one who cannot deny the sovereignty in the universe cannot deny the One Who is the Sultan of this sovereignty, either; because sovereignty cannot be without a sultan. If you cannot deny the Sultan, you cannot deny the Hereafter, either. Because by the arrival of the Hereafter, the glory of the Sultan gets protected. Therefore, we can say this: Surely, the Sultan, Who has power over everything and rotates the huge stars easily, is going to bring the Hereafter and give reward to those who truly serve Him. He is also going to throw some people who come to say in rebellion, “You cannot get hold of me, you have no power on me” into His eternal Hell, by imposing them the punishment they deserve. It is as clear and precise as this visible sovereignty.